provides support for most of the body’s weight making it not only an excellent form of exercise for healthy people, but it is also great for those affected by medical conditions such as arthritis and joint problems. The class meets at Fountain Pool. Water Aerobics is offered at 9am each Monday, Tuesday, Thursday and Friday year round. Evening classes will run June through August at 6pm each Monday, Tuesday, Thursday, and Friday. Monthly fees for 50 years old & over are $25. For under 50 years old monthly fees are $40 (city), $61 (county) and $102 (out of county). For more information call 478-293-1070 or register in our office. Pool hours for the season are anticipated to begin May 28th. Public Swim Hours will be on Tuesday and Thursdays-Sundays from 1:00pm-6:00pm. Admission into the pools is $3.00 per person. Payments may ONLY be made with cash (no checks or cards accepted at the pool). The Warner Robins Recreation Department will be holding registration for its 2019 Swim Lessons starting on April 15th. Swim classes are for ages 3 through adult. For more information, call 478-293-1070. The class has been developed to teach children 3 to 5 years of age with the assistance of a parent (or adult) swimming readiness by emphasizing fun in the water. Parents and children participate in several guided practice sessions that help children learn elementary skills, including water entry, bubble blowing, front kicking, back floating, underwater exploration, and more. 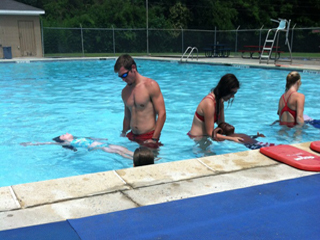 This level helps students feel comfortable in the water and to enjoy the water safely. Requirements: Designed for novices with little or no swimming experience. This level gives students success with fundamental skills. Requirements: Swimmer can enter the water unassisted, move 5 yards, bob 5 times to chin level and safely exit the water. Float on front with face in water and with support for 3 seconds, roll to back with assistance and float on back with support for 3 seconds. This level builds on the skills in level 2 by providing additional guided practice. Requirements: Swimmer can step from side into chest-deep water, move into a front float for 5 seconds, roll over to a back float, return to standing position, then move back to a back float for 5 seconds and return to a standing position. Push off and swim using a combination of arm and leg actions for 15 feet on the back. This level develops confidence in the strokes previously learned and to improve other aquatics skills. Requirements: Swimmer can jump into chest deep water from the side, swim front crawl 15 yards with face in water with rhythmic breathing, maintain position by treading or floating for 30 second and swim back crawl for 15 yards. This level provides further coordination and refinement of strokes. Requirements: Swimmer can perform a feet-first entry into chest-deep water, swim front crawl for 25 yards, maintain position on the back 1 minute in deep water (floating or sculling) and swim elementary backstroke for 15 yards. Swim breaststroke for 15 yards, tread water for 1 minute and swim back crawl for 25 yards. This level refines the strokes so students are able to swim them with ease, efficiency, power and smoothness over greater distances. Requirements: Swimmer can perform a shallow dive into deep water, swim front crawl for 50 yards, maintain position on back for 2 minutes in deep water (float or scull) and elementary backstroke for 25 yards. Swim breaststroke for 25 yards, tread water for 2 minutes and swim back crawl for 50 yards. Level 6 is designed with "menu" options, each of which focuses on preparing students to participate in more advanced courses such as Water Safety Instructor and Lifeguard Training.